This medical director form is designed to document a diagonstic medical laboratory's independent contractor agreement with its medical director. The agreement defines the medical director's responsibilities at the lab, his licensing and other professional requirements, the administrative services he must provide, and his availability and time commitment for the task. The agreement specifies a number of hours per month that the medical director must provide services, for which the medical director is paid a fixed monthly sum. The agreement contains a covenant not to compete which prohibits the medical director from providing similar services to third parties in specified counties. The form also contains a nonsolicitation provision which prohibits the hiring of lab employees or independent contractors of the lab by the medical director during the term of the agreement and during the year following the termination of the agreement. The form prohibits the use of lab premises for private medical practice by the medical director, or for the analysis of specimens which are not from lab clients. This Medical Director Agreement (“Agreement”) is effective as of ________, 20__, by and among MEDICAL LAB OWNER (“Medical Lab Owner” or the “Laboratory”) and _______________, Inc., a __________ professional corporation (“Corporation”) and __________, M.D. (“Physician”). A. Medical Lab Owner is a __________ corporation that operates a licensed clinical laboratory located at __________________ (the “Laboratory”). Medical Lab Owner is in need of an experienced, qualified physician to serve as medical director of the Laboratory. B. Corporation employs Physician, who is an individual licensed to practice medicine in the State of __________ with at least two years of experience directing or supervising the provision of laboratory tests of the same level of complexity as those provided by the Laboratory. C. Medical Lab Owner wishes to contract with Corporation to provide Physician to serve as medical director of the Laboratory (“Medical Director”) to ensure that high standards of clinical laboratory services are performed in the Laboratory. 1.1 Medical Director/Administrative Services. Medical Director shall serve as Medical Director of the Laboratory and, in this role, shall provide to Medical Lab Owner those administrative services set forth in Exhibit A. 1.2 Absences. Corporation shall designate, subject to the approval of Medical Lab Owner, a qualified replacement, in the event of Medical Director’s vacation or other temporary approved absence. The person who provides services on behalf of Corporation in Medical Director’s absence shall have at least two years experience directing or supervising the provision of laboratory tests of the same level of complexity as those provided by the Laboratory and be bound by all terms of this Agreement. Medical Lab Owner shall have the right to approve the length of Medical Director’s absence, and any unapproved absence shall constitute a breach of this Agreement. 1.3 Availability. At all times the Laboratory is open to provide laboratory services, Medical Director, or Medical Director’s qualified replacement, shall be accessible to the Laboratory to provide, onsite, telephone or electronic consultation as needed. Medical Director shall inform Medical Lab Owner, on a monthly basis, of Medical Director’s schedule and availability to provide services pursuant to this Agreement. 1.4 Time Commitment. Corporation shall cause Medical Director to devote a minimum of __________ (__) hours per month providing the services described in this Agreement. 1.5 Limitation on Use of Space. No part of Medical Lab Owner’s premises, including the Laboratory, shall be used at any time as an office for the private practice of medicine or to analyze patient specimens other than Medical Lab Owner patient specimens. 2.1 Medical Lab Owner Services. (a) Space and Equipment. Medical Lab Owner shall furnish the premises for the Laboratory and such equipment as may be reasonably necessary for the proper operation and conduct of the Laboratory. Medical Lab Owner shall repair, replace or supplement such equipment and otherwise maintain it in good working order. 2.2 General Services. Medical Lab Owner shall furnish ordinary janitorial services, maintenance services, and utilities, including telephone service, as may be required for the proper operation and conduct of the space that it provides under this Agreement. 2.3 Supplies. Medical Lab Owner shall purchase, through its appropriate departments, all supplies as may be reasonably required for the proper operation of the Laboratory under this Agreement. 2.4 Medical Lab Owner Performance. The responsibilities of Medical Lab Owner shall be subject to Medical Lab Owner’s discretion and its usual purchasing practices, budget limitations and applicable laws and regulations. 3.1 Compensation. 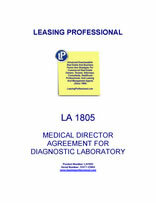 On or before the fifteenth (15th) day of each calendar month during the term of this Agreement, beginning with the second such month, and on or before the fifteenth (15th) day of the calendar month following the expiration or earlier termination of this Agreement, Medical Lab Owner shall pay Corporation ____________ Dollars ($_____) per month for the provision of laboratory-administrative services provided to Medical Lab Owner by Corporation under this Agreement during the preceding month. Corporation’s compensation for any partial calendar month during the terms of this Agreement shall be prorated based on the actual days this Agreement is in effect during such partial calendar month.